Following on from my morning jaunt around Studland Bay Nature Reserve, we return to the action, and I use that word in the loosest possible sense, among the moorland of Black Heath. 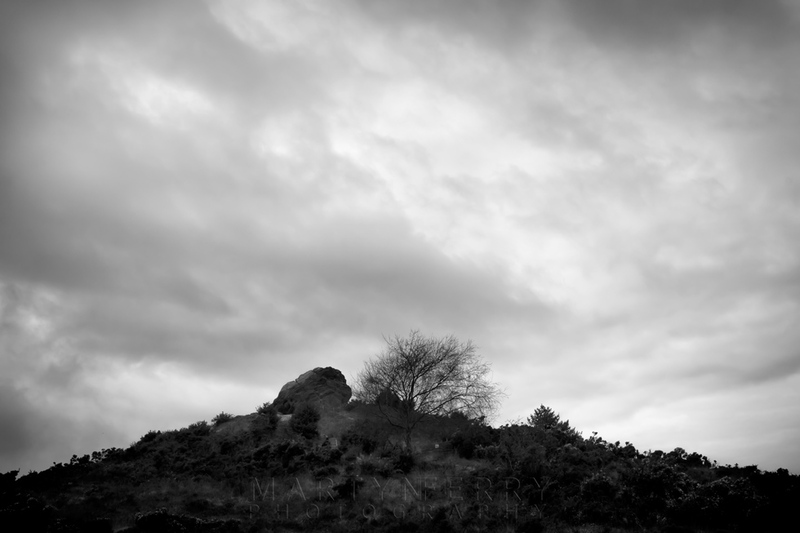 I didn't have a particular destination in mind, I was just out for a walk to see what I could see, when I spied a large outcrop in the distance that seemed too incongruous for it's surroundings to be ignored. My curiosity sufficiently piqued, I changed course, and following one of the pathways that snake their way over the undulating landscape, I headed towards it. I didn't know it at the time, it was only later when I did a bit of research that I found out all about it, but I was bearing towards Agglestone Rock, also known as the Devil's Anvil, or the Devil's nightcap. 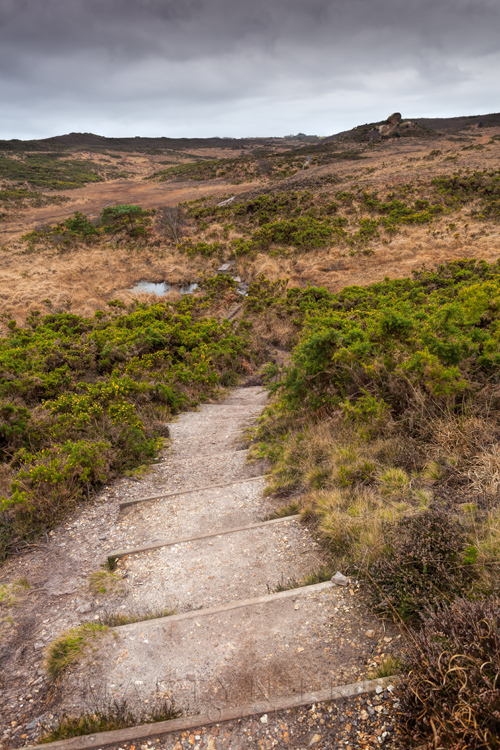 Steps leading down to boggy marshland, with Agglestone in the distance. Looking up to the stone from the bottom of the hill on which it sits. 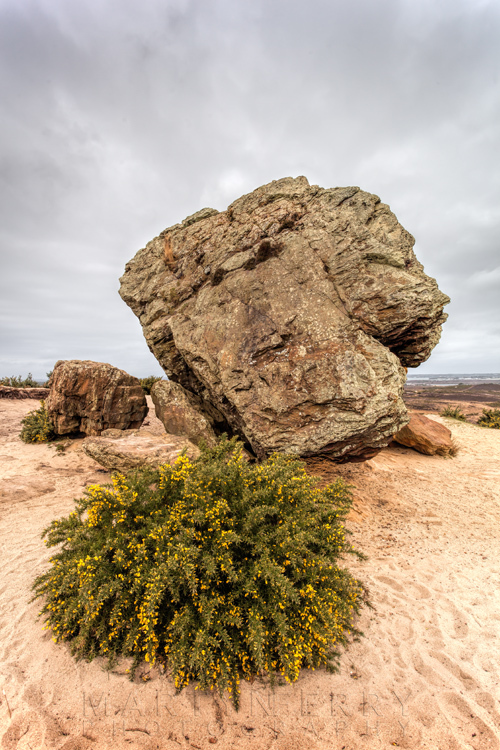 Agglestone Rock is a 20 foot high block of sandstone, weighing in at around 400 tonnes, perched on a natural 90 foot high conical hill. It is said the Devil was sitting on The Needles on the Isle of White when he saw Corfe Castle being built. He was so offended by the beautiful white tower of the Norman keep that he threw his cap at it, hence the Devil's Nightcap alias, the missile fell short however, and became the Agglestone. He could also have been aiming at Salisbury Cathedral, or Bindon Abbey among other targets, depending on which account you read. 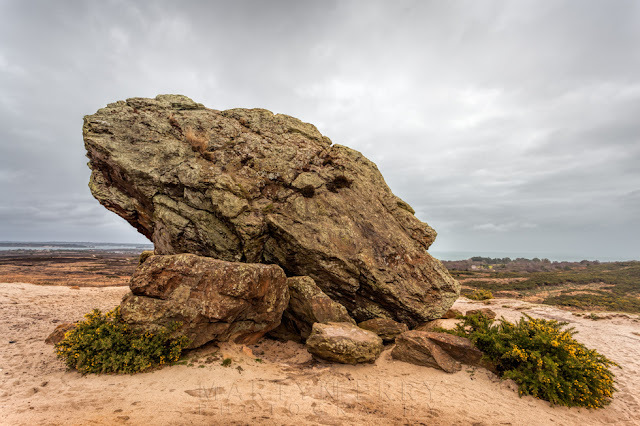 It gets its moniker of the Devil's Anvil, because it was originally anvil shaped, but it has been gradually eroded away over many thousands of years by natural forces, and in the 1970's it toppled over onto its side. You can see a picture of it here, taken in the early 1900's when it was still upstanding. 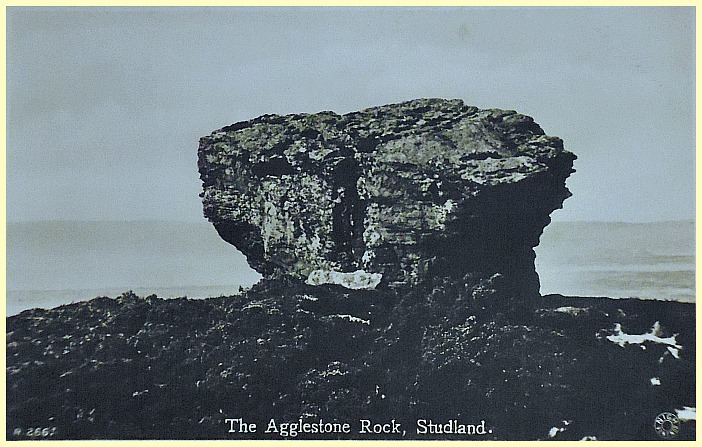 The name Agglestone could be a derivation of Eagle Stone, or possibly Wobble Stone because 'aggle' is the local word for wobble or wobbly. 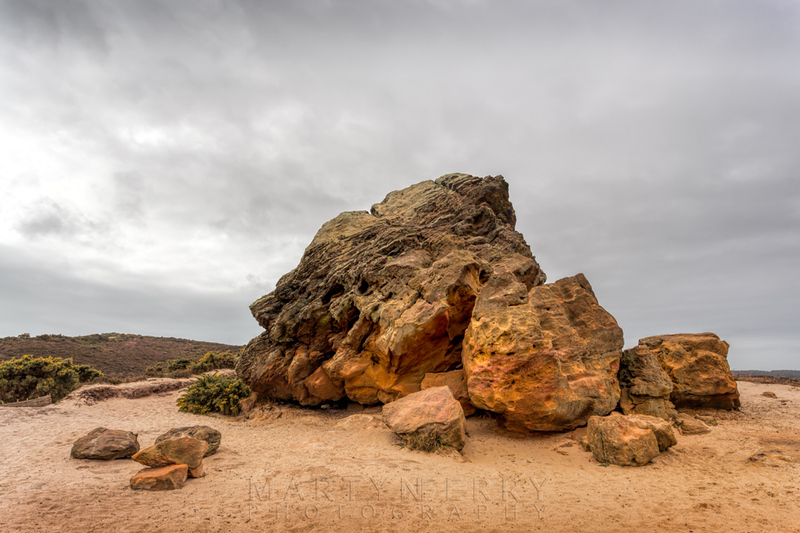 Up close, the rock is even stranger than it is from a distance. I felt the need to inspect it from every angle. I know it's just a huge block of several million year old sandstone, but it there was something about it that continually drew my attention, I literally couldn't stop looking at it. 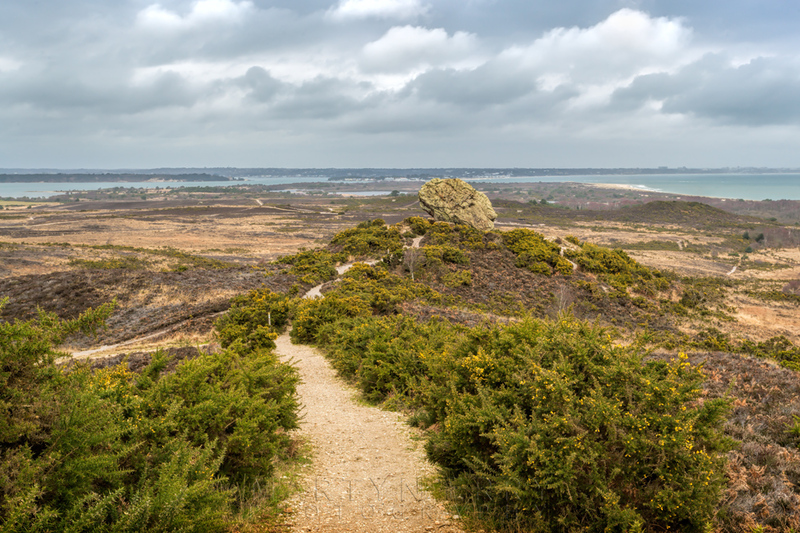 Walking a bit bit further on, I looked back and took this shot of the rock surrounded by Black Heath, in the distance on the right of the rock is the large expanse of Poole Bay, and just to the left of it is a small body of water, this is Little Sea. 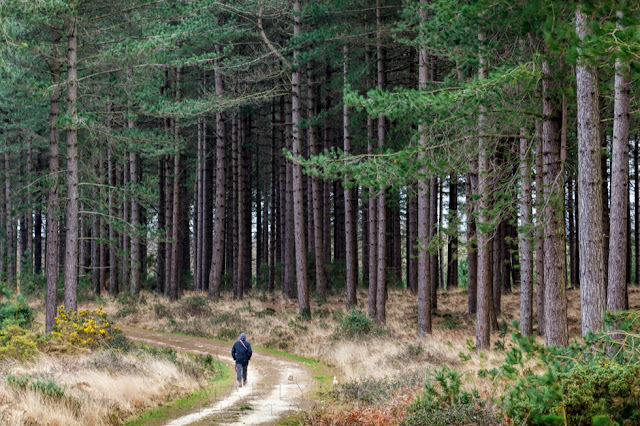 Once I'd had a good poke around and looked at it from various perspectives, until I felt I'd seen it from all angles, I headed back the way I'd come, and carried on with the route I was originally going to take, before the curious monolith had diverted me. Not that I was complaining, I was glad I'd made the effort to go and see it, especially as I wasn't expecting it to be there. It was a welcome surprise. 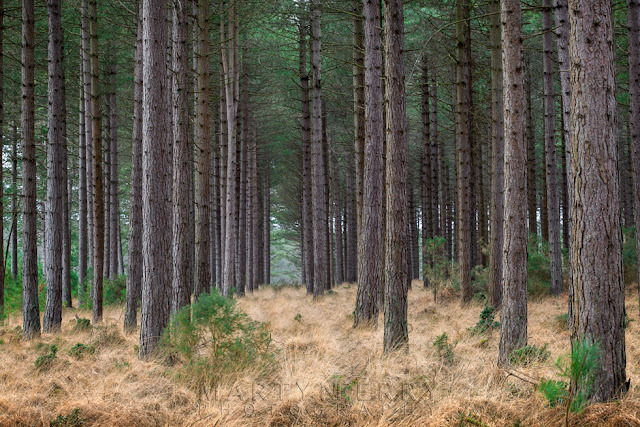 Walking through the heart of the heathland, and following a parallel course with the shores of Brand's Bay, one of the larger bays that line the perimeter of Poole Harbour, about a mile or so in the distance, I chanced upon another unexpected find, namely a magnificent patch of pine woodland. 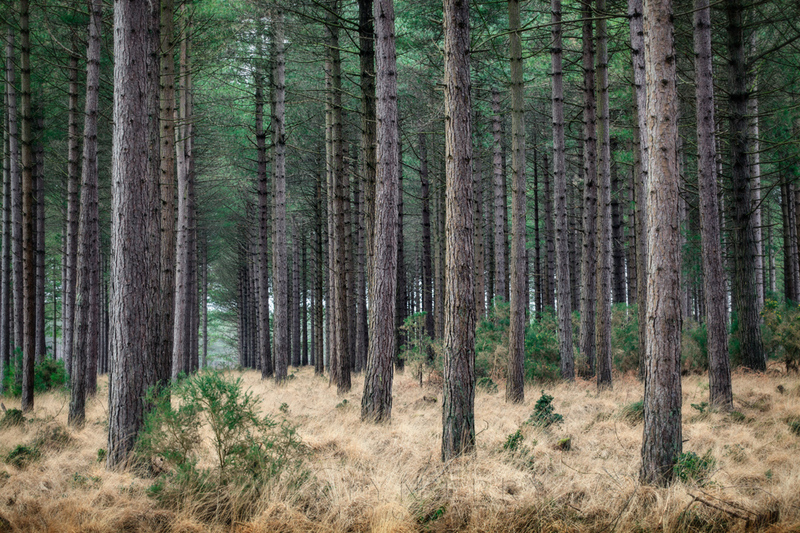 Filled with row upon row of towering, elegant trees, their bare trunks straight as pins, I could see I was going to spend not a small amount of time amongst their comely timber. 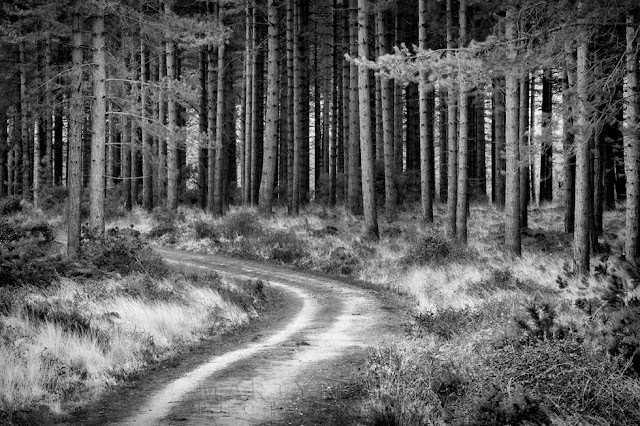 A winding path meanders its way through the trees. And to give you an idea of the size of these beauties. Even though it was the weekend, I think because of the remoteness of the woodland, I saw maybe two other people the whole time I was there. 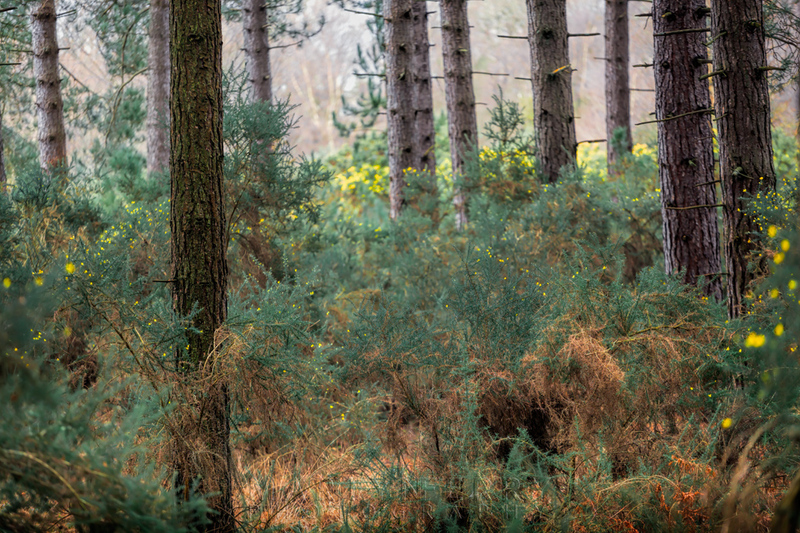 Birdsong was what accompanied me for most of my visit. Ruler straight trunks under an emerald canopy. 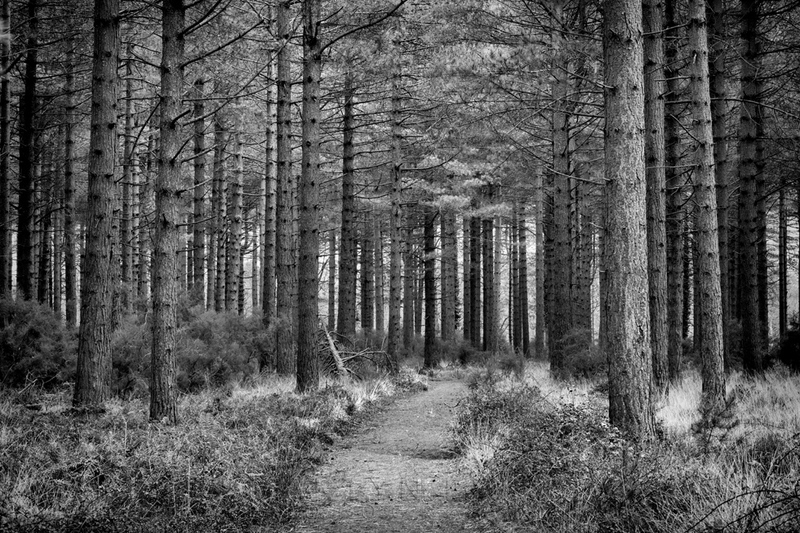 That was the problem, there was always something else to catch the eye and pull you further along, despite it looking at first glance to be a rather desolate and empty corner of Dorset, it really was an interesting place once you started exploring it, and I'll definitely head back there when I return to the area. Once I'd got back to the car, which took a lot longer than I had anticipated, I drove to Knoll Beach, not because I wanted a stroll on the beach, far from it, but because the National Trust have a cafe there, and as I hadn't eaten anything since breakfast, I was keen to hunt down a bacon sandwich and a cup of coffee. Thankfully they had both, so feeling very happy indeed I headed back to Swanage for a bit of R&R, and to decide where to go for sunset. On the way back though it started to rain, and it continued to rain well into the evening, so sunset was out the question. But I wasn't overly put out, I felt I'd done enough exploring for one day.